My sister first got the idea of painting aerial landscapes when she and our brother Burke were flying from Savannah, Georgia to Hilton Head, South Carolina in 1980. Captivated by the complex patterns of the coastal islands, she’s been hooked on aerial perspective ever since. She started making batiks during her senior year in college. Now she works full-time at her waterfront property on James Island, just south of Charleston, South Carolina. For each landscape batik, which takes days and often months to complete, she uses a technique that involves painting hot wax on areas she doesn’t want the dyes to penetrate. For thin lines she uses a tjanting tool, which allows wax to flow like ink through a bowl with a copper spout. After waxing she dyes the cloth. Then she or an assistant sandwiches the cloth between papers and heats it with an iron until all the wax is removed. The heat also sets the colors. At any point in the process, an improperly mixed dye can ruin the entire work. 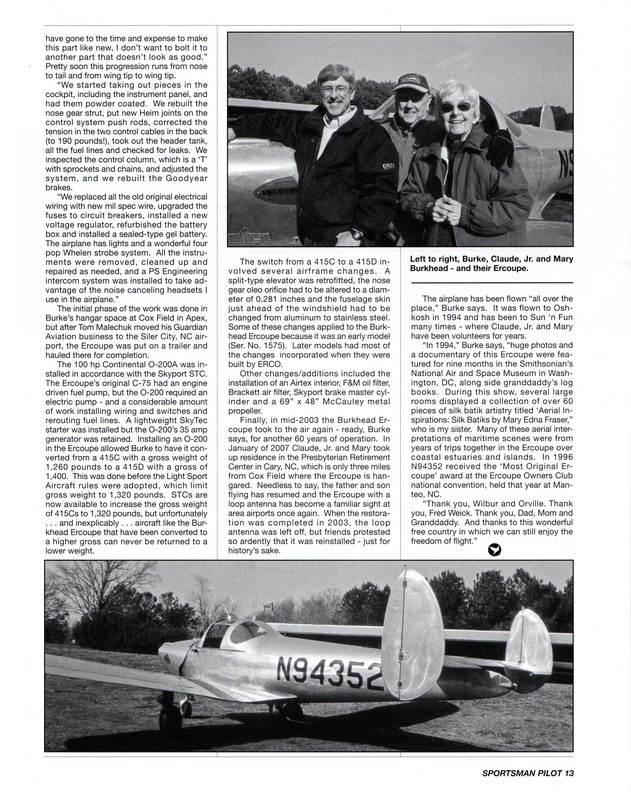 Claude Burkhead III (left) and Mary Edna Fraser with N94352, the Ercoupe that has been in their family for three generations. Mary Edna Fraser’s swirling, colorful silk batik prints take their inspiration from life—specifically, life observed from 3,000 feet in an Ercoupe above the Georgia coast. Fraser, of Charleston, S.C., has created numerous works with distinctly aerial perspectives, which she describes as a series of narrative landscapes “where realms of earth, sea, and sky converge.” She researches the areas on foot, via boat, and from an airplane, documenting first with a Nikon camera before setting dyes to silk. She has created works inspired not only by the coastal areas of Georgia and South Carolina but also the canyons of northern New Mexico and the Appalachian Mountains that ramble from Alabama up to Newfoundland. 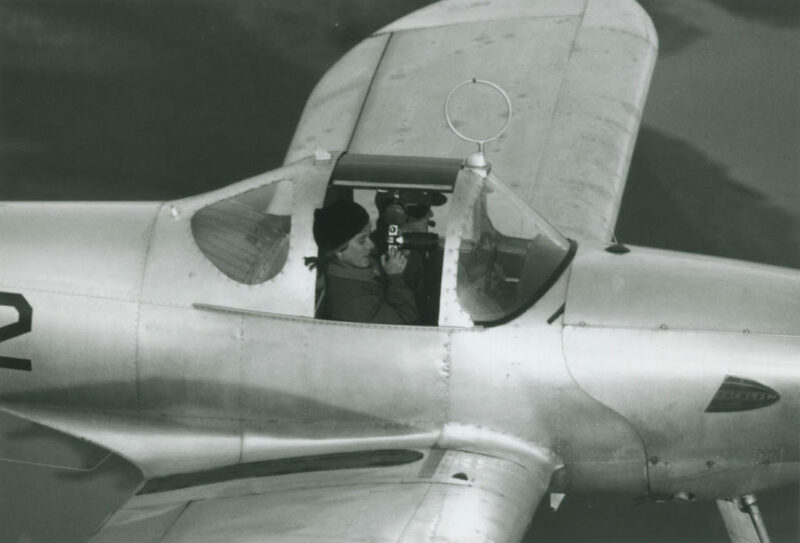 While Fraser has worked with silk batiks since she was in college, it was her family’s beloved 1946 Ercoupe 415C that showed her the images that would become the foundation of her work. Flying with her brother, Claude Burkhead, over the Georgia barrier islands, Hilton Head, and Bluffton, S.C., Fraser pulled out her camera and began shooting the ribbons of earth and water beneath her. Back then, she used a Nikon camera and film. She and Burkhead recently recreated that trip—and Fraser shot the same route, this time with a digital Nikon. 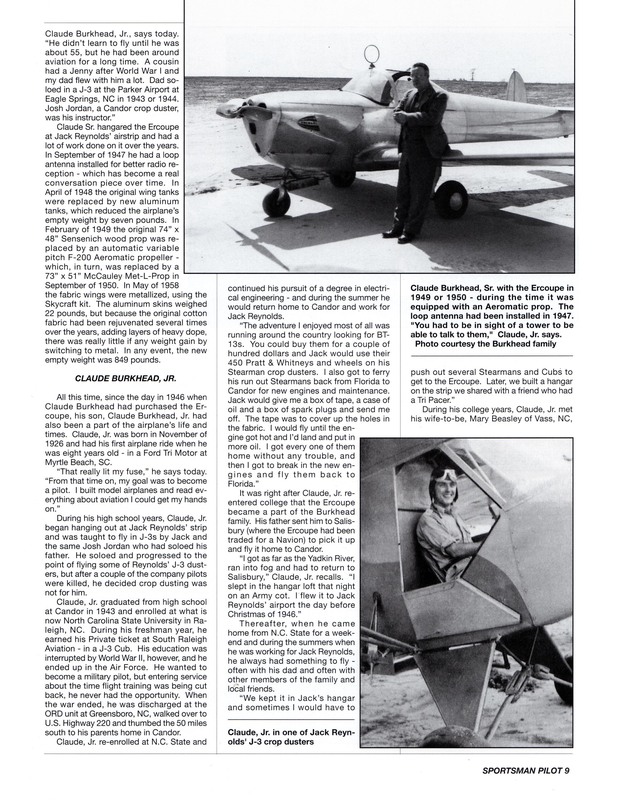 N94352 has served three generations of pilots in the Burkhead family, starting with Claude Burkhead Sr., Fraser’s grandfather. Her father, Claude Burkhead Jr., “used to court Mother by flying into Vass (N.C.) to pick her up,” Fraser says. 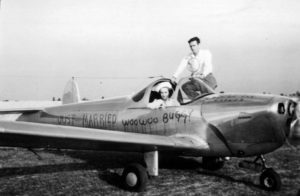 “They called it the ‘woo-woo buggy.’” When Burkhead married his sweetheart, they flew the woo-woo buggy to New Orleans for their honeymoon. Fraser flew with her father from toddlerhood. “We always flew, it was normal to fly,” says Fraser, who adds that she liked night flights best. 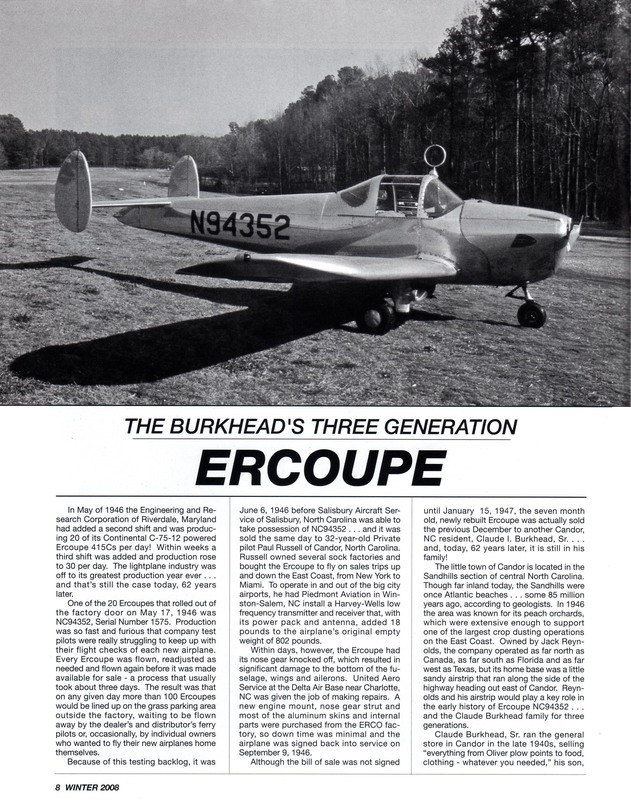 The Ercoupe is a local celebrity, as it is a pristine example of the non-spinnable aircraft designed by Fred Weick. In 1994 it was the star of a documentary and photo exhibit in the Smithsonian National Air and Space Museum in Washington, D.C. 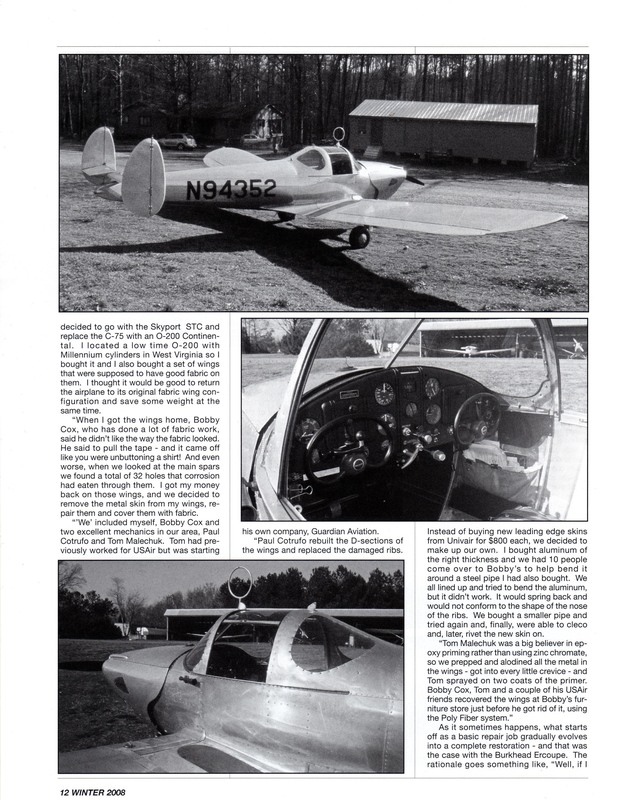 The winter 2008 issue of Sportsman Pilot details the meticulous restoration that the Burkheads performed on the airplane, which included replacing the original Continental C-75 with a 0-200 with Millennium cylinders and removing the metal skin from the wings and covering them with fabric. They had removed the distinctive loop antenna on the canopy but put it back when friends protested. Fraser does not have a pilot certificate, but she frequently hires flight instructors to take her aloft so that she can shoot images. And she doesn’t sit in the right seat and let them do all the work. She’ll take off and land, and maneuver the aircraft into position. Only then will she turn the controls over to the flight instructor so that she can take as many as 500 shots. 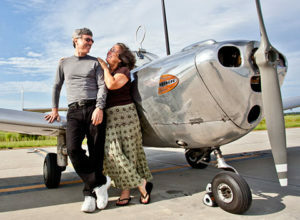 “I fly all different kinds of airplanes, which is great fun,” Fraser says. Fraser’s batik images also illustrate A Celebration of the World’s Barrier Islands by Orrin H. Pilkey (Columbia University Press) and Global Climate Change: A Primer, by Orrin H. Pilkey and Keith C. Pilkey (Duke University Press). Her sculptures have been exhibited in museums, airports, and public libraries.